Water damage emergencies can be an incredibly trying time for property owners, especially if you have never experienced them before. Flooding on the property can be overwhelming and it can be difficult to know what to do next. It’s important in these instances to leave the water removal to the professionals, and to call the experts at 911 Restoration of Redlands. The experts are trained in all kinds of water remediation, so your needs will be handled with care. They employ an optimistic attitude and put the customer first in all instances. You don’t need to worry, as they are available around the clock so you will never be left waiting. The professionals respond to all calls within 45 minutes, so you will receive speedy care. 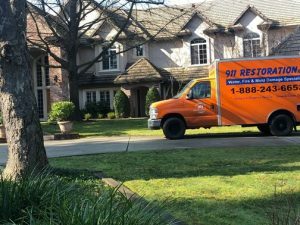 The technicians are IICRC certified and have years of experience, so you can rest assured knowing that you are receiving the best water remediation possible. When you need a water extraction on your property with a quick turnaround, call 911 Restoration of Redlands. The techs in the Redlands area understand that it is often not just the flooding that can impact a property, but it can leave lasting effects as well. That’s why they take the time to make sure all areas of the property are taken care of. The techs take the extra care to ensure that every inch of the property is clean and dry. There can be many causes of floods on the property in Redlands. Inclement weather such as heavy rains can lead to the flooding. In addition, unexpected cold temperatures in the winter can lead to frozen or bust pipes. Water damage emergencies on the property can also be caused by sewage backup. It’s important to conduct regular inspections on the property to ensure that everything is in proper and working order. These inspections from a certified plumber can help put a halt to any water remediation in the future. Water leaks in the Colton area can be difficult to deal with, and it can be easy to feel distressed. There is no reason to be concerned though, because the technicians have your back. They will take care of any flood cleanup in a timely manner, and ensure that your property is safe and dry quickly. In addition, the techs ensure that the rest of your belongings stay in their best condition with packing services. They box up everything that is not previously damaged and put it in storage so it stays safe and dry. With any disaster cleanup, you deserve a team that takes your needs into consideration. Call 911 Restoration of Redlands today for the best care possible. Unfortunately, mold contamination can follow shortly after any property flooding. Any excess moisture left on the property can cause these black spores to grow almost immediately, and they can be incredibly difficult to remove without assistance. It can be dangerous to attempt to take care of it on your own, so it’s important to call the professionals to take care of it. The Rialto mold removal technicians work with care to ensure that your property is safe again. They utilize special equipment such as hazmat suits and infrared cameras to find all possible sources of moisture on the property. Usually mold can be hidden in dark spaces, such as crawl spaces, but the techs go the extra mile to ensure that there are no spores left behind. The experts are highly trained in any kind of mold inspection. Their years of experience in decontamination means that they always put the customer first, and understand what a difficult time this is for them. It’s important to leave this task to the mold removal techs, as attempting to remove the fungus on your own can create further problems down the line. In addition, the spores can lead to difficult symptoms if left untreated, such as headaches or a cough. The techs put your health first and even use third-party laboratory testing to ensure that the fungus will not come back. Whether you need the mold removed from hardwood floors or an inexpensive comprehensive service, you can count on the technicians to go the extra mile. 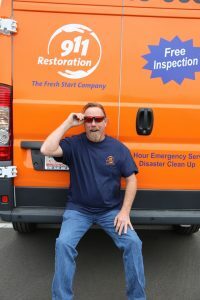 The techs truly understand what it takes to take care of any flood cleanup due to their years of experience. 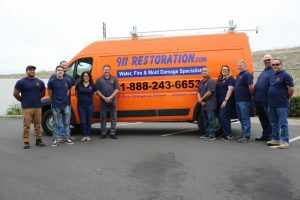 When you want a water remediation service you can count on, call 911 Restoration of Redlands today. Both you and your property will receive a Fresh Start in no time. Call today to get immediate help. Servicing the cities of Colton, Highland, Loma Linda, Rialto, San Bernardino, Yucaipa, and surrounding areas.